At our premier facial plastic surgery practice in Charlotte, we’ve seen many patients who have wanted a cosmetic procedure for their face or neck but have hesitated because they didn’t want to deal with surgery. For these patients, it might be time to reconsider. Many non-surgical facelift procedures are just as safe and effective as traditional surgery and offer age-reducing benefits to a patient’s appearance. At Carolina Facial Plastics in Charlotte, board-certified facial plastic surgeon Dr. Jonathan Kulbersh and his staff are proud to offer Botox, lip augmentation, and other non-surgical facelift options to meet a patient’s facial cosmetic needs. The gold standard in wrinkle reduction and prevention – with a safety record to match – Botox works best on dynamic wrinkles. Dynamic wrinkles form when the repetitive movement of an underlying facial muscle leads to the formation of skin folds or creases. A non-surgical neuromodulator, Botox targets the troublesome muscle to relax it. This causes the overlying facial crease to gradually smooth out, making the doctor’s skill and technique of utmost importance. If patients were to choose a doctor with little experience in Botox, it would difficult to achieve the natural, subtle effects that the patient wants. Botox results typically last 3-4 months. Due to the fine needles used for the injections, most patients feel nothing more than minor pinching or stinging during the procedure. Dr. Kulbersh also uses Dysport in his practice in Charlotte. Dysport and Botox are both neuromodulators and are used in the same manner, though Dysport may act faster and last longer in some patients. Loss of volume in your skin is a major reason for the aging process. FDA-approved injectable hyaluronic acid (HA) dermal fillers such as Juvéderm and Restylane are effective treatments, as they help restore volume and balance and proportion to the facial features. HA fillers are great at adding volume to create high and defined cheekbones. Additionally, these fillers can lift sagging tissues, strengthen the jawline, rebalance the facial features, and fill in facial wrinkles. To make things even better, each of these treatments are non-surgical. Sculptra is a volumizing agent known for its effectiveness and longevity. It is made from poly-L-lactic acid (PLLA), which not only restores pliability to the skin but also stimulates the natural production of collagen by the body. In fact, Sculptra targets the support structure of the skin and reinforces it. 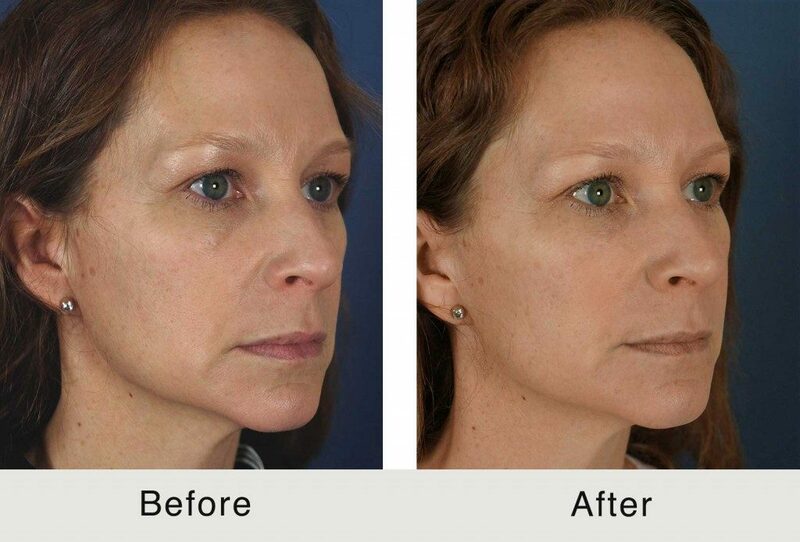 With this injection, patients receive natural-looking facelift and volume for 12-18 months. Dermal fillers and volumizers are safe as well as beneficial. Side effects from Juvéderm, Restylane, and Sculptra are minimal, though they occasionally may include, bruising, or slight swelling. Another common non-surgical face treatment is lip augmentation with Juvéderm or Restylane. Each of these injectables is versatile enough in helping the lips look fuller in addition to reducing the appearance of wrinkles. Although many people have naturally thin lips, aging can cause the lips to thin as well. Lip augmentation is a common and effective way to improve thin lips. Using a blunt tip cannula rather than a needle, these HA fillers are injected delicately and precisely, resulting in thicker, more voluminous, more alluring lips that look completely natural. Side effects are minimal – minor bruising or swelling may occur – but the effects of these fillers are immediately noticeable and will last 6 to 12 months depending on the type of filler used. A non-surgical facelift is a combination treatment that optimizes a patient’s facial rejuvenation procedure without a single incision. A non-surgical facelift combines various dermal fillers (Juvéderm or Restylane, for example) with a neuromodulator (e.g., Botox or Dysport) and skin care treatments to enhance and revive your appearance. Results of a non-surgical facelift can vary due to the variety of fillers used in the treatment, but results typically last 6-18 months. Skin care treatments involve chemical peels and laser treatments to tighten skin and smooth the texture and tone. Side effects of a non-surgical facelift are similar to those of dermal fillers, with the addition of the skin peeling for a few days after the skin care treatment. For a non-surgical neck lift to improve the appearance of the entire neck area, Kybella is typically a patient’s best bet. Although most parts of the face lose volume due to aging, the neck usually gains fat, resulting in a double chin or turkey neck. Kybella is an injectable non-surgical neck lift derived from a concentrated form of deoxycholic acid, a natural substance produced by the body that fights fat. When injected into the fatty parts of the neck or jawline, Kybella melts the fat gradually, yet safely and effectively. The results are often elegant and head-turning. Kybella injections are administered after a topical numbing agent is applied, ensuring a more comfortable procedure for patients. Side effects may include mild soreness, redness, swelling, and bruising around the treatment site, but they usually subside within a week. Downtime is usually no more than a day, and a typical treatment plan includes injections every 4-6 weeks for 2-4 sessions. Learn more about the revolutionary non-surgical treatment Kybella at WebMD.com. There are many non-surgical facelift options for patients to consider if they are apprehensive regarding surgery. Dr. Kulbersh is a Beverly Hills-trained, double board certified facial plastic surgeon who can create a treatment plan to enhance, refresh, and rebalance a patient’s natural facial features. Choosing a doctor who can help guide a patient through the process is one of the most important decisions a patient can make, as a good doctor will help patients lead them to realistic and excellent outcomes. If you are interested in learning about non-surgical facelift treatment options, please contact our facial plastic surgery practice today. Next, read 5 Ways Blepharoplasty Can Give You a Youthful Appearance.